Wilfrid Clerton, has spent his life sailing on an array of different racing and cruising sailboats. His sailing experience and mariner’s know-how ensure a high level of preparation for the boats in the « Cap au Cap Location » fleet, and guarantee excellent conditions for your sailing trips. He will give you invaluable advice concerning your choice of charter and your navigation plans. Always available to answer your questions, he will be able to give you technical solutions as quickly as possible. Katia Giraud, has 20 years’ sailing experience and is in charge of the administrative, financial and logistics management of Cap au Cap Location. 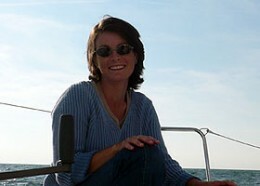 She organises your arrival, does the inventories, plans boat maintenance, cleaning etc. Together, after preparing several transatlantic races and journeys on « Class 40 » and « 60 foot» sailboats, « catamaran cruisers», and the 23-meter monohull, the « KVIII », Katia and Wilfrid have gained solid technical and logistical expertise which enables them to organise your sail on board one of the boats in the «Cap au Cap Location » fleet.